In a new PRA paper, we theoretically analyze a scheme for fast stabilization of arbitrary qubit states with high fidelities, extending a protocol recently demonstrated experimentally. Our scheme utilized red and blue sideband transitions in a system composed of a fluxonium qubit, a low-Q LC-oscillator, and a coupler enabling us to tune the interaction between them. Under parametric modulations of the coupling strength, the qubit can be steered into any desired pure or mixed single-qubit state. 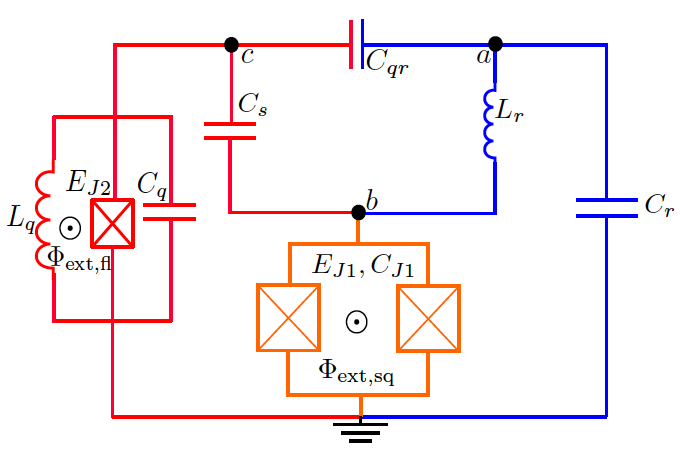 For realistic circuit parameters, we predict that stabilization can be achieved within 100 ns. By varying the ratio between the oscillator’s damping rate and the effective qubit-oscillator coupling strength, we can switch between under-damped, critically-damped, and over-damped stabilization and find optimal working points. We further analyze the effect of thermal fluctuations and show that the stabilization scheme remains robust for realistic temperatures.